Metro Manila, in the Philippines, is one of the major global agglomerations where air quality has degraded severely over the past years due to an immense increase in the volume and density motor traffic. Air quality in Manila is distinct in that the particles observed here show an unusually high impact of fresh soot emissions. It is widely acknowledged by health researchers that soot in ambient is one of the major hazards related to environmental pollutants. MACE-2015 is an atmospheric research project that will shed light on the characteristics and absolute levels of particulate air pollution in Manila, and provide scientific reference data that can be used to analyse and disentangle the special complex of regional air quality problems. From March to June 2015 specialized instrumentation in a container laboratory will be used to characterize and quantify vehicular emissions along two different roadside observation sites on Katipunan Avenue (Quezon City) and Taft Avenue (Manila City). 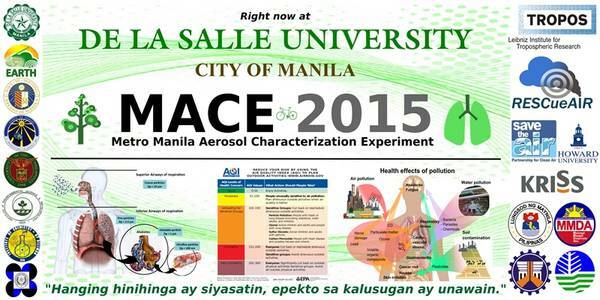 MACE-2015 is a collaborative effort between TROPOS and the Philippine Researchers for Clean Air (RESCueAir) consortium. MACE-2015 collaborators include, among others, the University of the Philippines in Diliman, the Manila Observatory, and the De La Salle University. The consortium suggests that the measurements of particulate pollution in MACE-2015 will lead to a better understanding of their impact on the environment and public health, and help stakeholders formulate targeted abatement measures. According to the National Statistical Coordination Board (NSCB) data, the number of registered motor vehicles in the Philippines has increased from 3.7 million to 7.5 million from the year 2000 to 2012, of which is registered in the National Capital Region. This doubling of vehicle fleet in a span of twelve years, is tantamount to traffic-related pollution levels especially in densely-populated urban centers such as Metro Manila. The 2009 Emissions Inventory of the DENR Environmental Management Bureau (EMB) reports that 63% of the country’s emissions are attributed to traffic-related (or mobile) sources; 82% is estimated for the National Capital Region (NCR). Aerosol particles are solid or liquid materials that are ubiquitous in the air. In an urban location, their main sources are traffic-related exhausts such as those from motor vehicles. Smoke houses, meat grilling, open burning of solid wastes, building exhausts, generator sets, road dust, manufacturing and construction activities contribute to aerosol particles as well. Natural sources can be sea sprays and volcanic dusts. Aerosol particles are specifically relevant because of their size, chemical composition and levels in the environment.